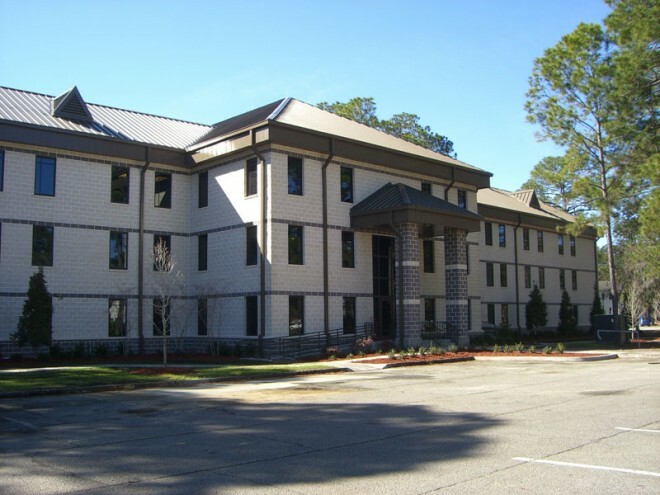 The administration facility is a 24,600 SF, three story steel framed structure used for office space in support of training programs at the FLETC. This project includes significant demolition of existing building components then renovation to a new administrative facility as defined by an existing set of renovation drawings and specifications provided for use as a part of the solicitation. Furnishings, equipment and fiber/ copper/cable TV cabling were provided for all spaces. Personnel elevators and space for electrical, mechanical, IT and janitorial equipment were required. Site improvements such as exterior lighting, sidewalks, landscaping and handicapped parking were included. The building has the goal of reducing energy use by 30% compared to the baseline building performance rating per ASHRAE Standard 90.1- 2004 Energy Standard for Buildings. The building is on track to achieve a LEED Gold rating.